The USPS prefers addresses in the upper case format for OCR readability. As a result they return all NCOA data in upper case. TrueNCOA by default also outputs NCOA files in upper case. Since this is not a strict requirement for the USPS, and because this is not always a desirable format for updating your database, TrueNCOA now allows you to export in proper case. 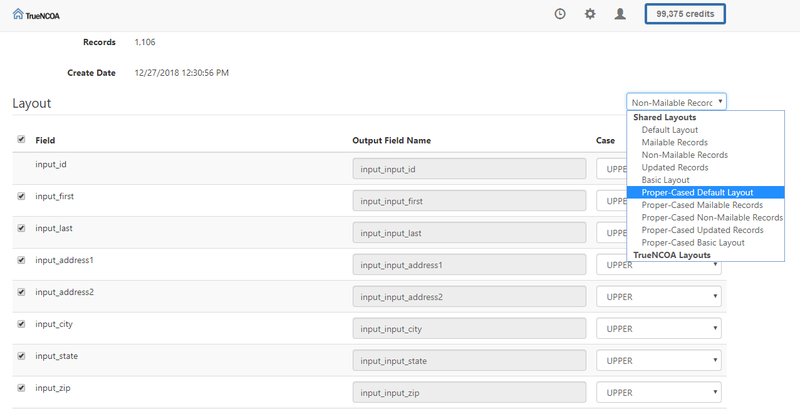 Our default layout returns all NCOA data with name and address fields in upper case. If you would like to select which of these fields should export in proper case individually, you can take the following steps. Once your file has finished processing, click the export button on the top left of the file detail page. On the export page you will see a list of all the export fields in the Layout section. Mailable Records Layout: This layout returns all records that are considered deliverable by the USPS. These include all Current and Active records and exclude vacant, invalid, and failed DPV records. Non-Mailable Records Layout: This layout returns all records that are considered non-deliverable by the USPS. These include all Historical records and Active records that failed DPV or are vacant and invalid. Once you have selected which fields to export in proper case, you can click "Download" in the upper left to download your file. If you do not want to edit individual name and address fields for proper case, you can now select on of our preset proper cased layouts. Proper-Cased Default Layout: This layout includes all of the fields you have come to expect on a TrueNCOA export. Proper-Cased Mailable Records Layout: This layout returns all records that are considered deliverable by the USPS. These include all Current and Active records and exclude vacant, invalid, and failed DPV records. Proper-Cased Non-Mailable Records Layout: This layout returns all records that are considered non-deliverable by the USPS. These include all Historical records and Active records that failed DPV or are vacant and invalid. Proper-Cased Updated Records Layout: This layout returns all records that were updated by the DPV and NCOA process. These records should be updated in your database. These records include Current records and records that have been standardized to the USPS preference. Proper-Cased Basic Layout: This layout returns your top level fields needed to make your database update decisions. The fields returned include name fields, address fields, vacant, invalid, residential delivery indicator, and move data. To export using one of the above, simply select the desired layout from the layout drop down menu at the upper right of the Layout section on the export page. Once the desired layout has been selected, you can click "Download" in the upper left to download your proper cased file. Once you have purchased a file you can download it as many times as you like without additional charge, so feel free to download and explore the various layout options.